GKN Driveline has announced that its order book for electric driveline (eDrive) technologies hit a record £2 billion by the end of last year following a series of significant programme wins with major global automakers. The order book growth underpins and extends GKN’s market-leading position in eDrive systems. GKN’s success is accelerating its annual eDrive sales growth. Sales, which were previously forecast to rise from £33m in 2017 to £200m in 2020, are now expected to increase over eight-fold to £275m. In 2022, GKN forecasts that eDrive sales will reach £500m. GKN’s success has been achieved through a long term commitment to Research and Development. In 2017, the Research and Development expense charged to the income statement was £36m, with total investment of over £123m over the past six years. Whilst impacting near-term financial performance, this investment is now delivering strong sales and order book growth. Through the R&D programme, GKN is rapidly bringing full systems capability to the market and is able to offer a range of solutions to meet customer demands. GKN is delivering components, sub-systems and full-systems in response to a variety of OEM needs. Building on systems integration leadership recognised by recent Automotive News PACE Awards, GKN will be adding GKN eMotors to their gear and torque management technology portfolio. As at 31 December 2017, GKN’s order book relating to eDrive was £2 billion following a number of major programme wins. Phil Swash, Chief Executive Officer of GKN Automotive, said: “Customers worldwide choose to work with GKN on their electric programmes because of our real-world experience in eDrive systems. Whilst our competitors talk about the potential of their technologies, we have proven history of delivering innovative electric driveline systems in customers’ cars on the road. GKN is developing new technologies to constantly improve electric vehicles. The new multi-speed system, the eTwinsterX, unveiled at the 2017 IAA Frankfurt Motor Show brings torque vectoring and improved handling, performance, and efficiency. This system will be demonstrated to customers during the 2018 Wintertest in Sweden. Cementing its position as an eDrive innovator, GKN has agreed a multi-year partnership with Panasonic Jaguar Racing, providing design, manufacturing and engineering services to the Formula E team. GKN has been working on eDrive and hybrid transmissions for plug-in hybrids and pure electric vehicles since 2002. From supercars to delivery vans, GKN’s eDrive systems are in a broad range of innovative and market-leading vehicles. 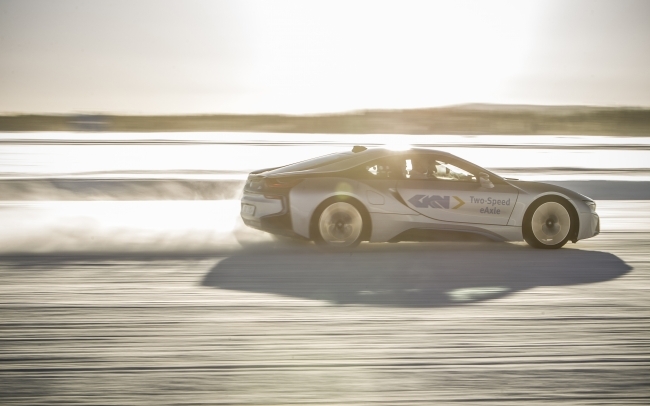 GKN’s electric driveline systems are helping to power cars such as the Volvo XC90 T8 Twin Engine, the BMW 2 Series Active Tourer, the BMW i8, the Porsche 918 Spyder and the Mitsubishi Outlander, one of the biggest selling plug-in hybrids on the market. In addition to established OEM customers, GKN is working with new entrants into the market that are looking to bring new ideas to mobility and how we travel. GKN’s electric driveline technologies have been recognised for their innovation through two PACE Awards. The world’s first two-speed electric axle, which enables electric power across a vehicle’s entire speed range, received a PACE award in 2015, which was followed by an award for the co-axial eAxle that delivers electric power to the wheels of the T8 Twin Engine variants across models on Volvo’s SPA platform, including the Volvo XC90, V90, S90 and XC60.